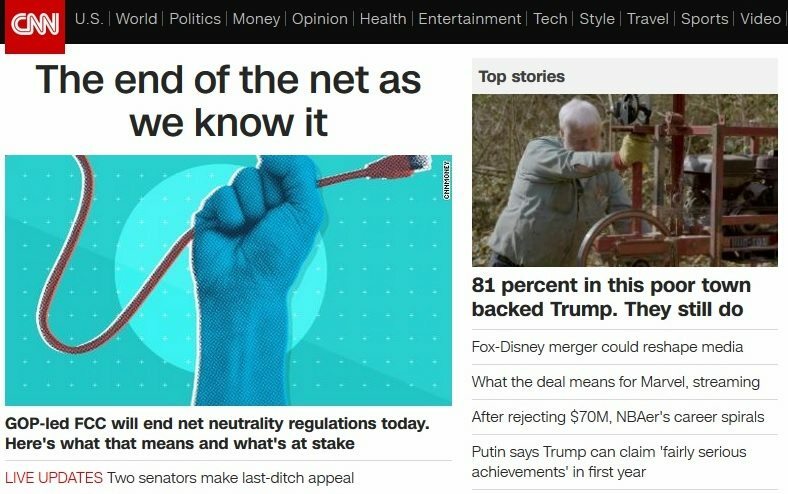 This morning’s CNN top headline “The end of the net as we know it” is one of the most biased and misrepresented headlines I have seen in a while. Ending the internet as we know is meant to sound like Armageddon is approaching if net neutrality is repealed. As “we know it” is so deceitful because the rule has been on the books for only two years. No consumer can tell the difference between 2015 and the previous ten years of the internet because the previous 10 years were not a disaster for internet users as CNN implies. Net Neutrality is an awful rule that regulates the private property of others. Telecommunication companies have spent billions laying down the cable and satellites infrastructure that made America’s internet to accessible and fast. They spent the money — it belongs to them. The article tries to scare readers into believing that telecommunication companies are in a conspiracy to slow down your internet and block what you see. In reality, there has always been a problem of slow internet, and that it relates to everyday problems like people in your own home downloading too much video or it might be on a larger scale like companies like Netflix that at one time consumed a third of all internet traffic during peak times — something that Netflix can do for free without cost. Internet providers have every right to use their own ideas to solve internet traffic problems on their own lines which are used by third party companies that pay nothing. Furthermore, we can’t expect companies to invest billions more in telecommunications if at any moment the government is going to steal away your investment and give it away free to others. Net neutrality is government over-reach and should end. P.S. Furthermore, the sub-headline reads, “GOP-led FCC…”. Hmmmm. Did CNN refer to the FCC as “Democrat-led FCC” during the Obama administration?